Sony has launched the MUTEKI V90DW, a powerful new audio system that brings together brilliant lighting feature options and excellent sound quality to create an immersive listening experience. Standing at an impressive 170cm tall, the tower design of this speaker makes listening a complete, captivating experience. The sound system also features speaker lights and multi-coloured woofer lights that change according to the beat. The V90DW supports music services such as Google’s Chromecast built-in and Spotify Connect. The touch panel user interface backlit, making it easy and convenient to skip tracks at any time of day or night. The V90DW features a Spread Sound Generator, which is a more open cabinet at the back of the speaker to increase the range and spread of the music. Additionally, front-facing mid-range speakers and tweeters angle out at 20 degrees in a horn-like style to maximise the reproduction of sound across the room. With the Sony Music Centre and Fiestable mobile apps, the V90DW can wirelessly synchronise up to 10 compatible speakers for an all-encompassing and engaging experience. The V90DW also connects wirelessly with the already available V77W and can be easily transported due to its built in casters. 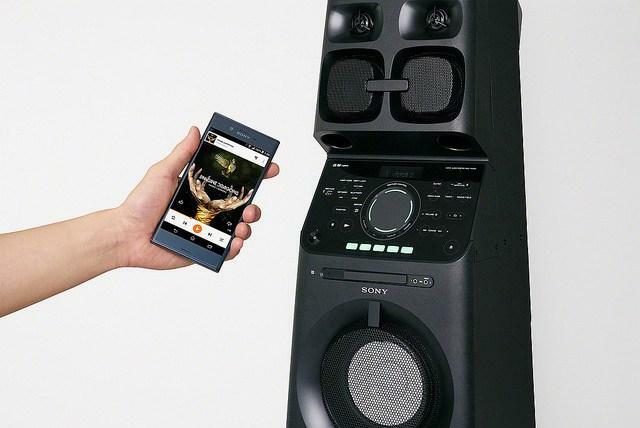 By connecting via the Sony Music Centre and Fiestable app, users can control the lighting, add sampler and DJ effects as well as control the basic functions of the speaker. Gesture control means that various features can be controlled with a wave of the hand, making it easier than ever to get the music playing and the party started.